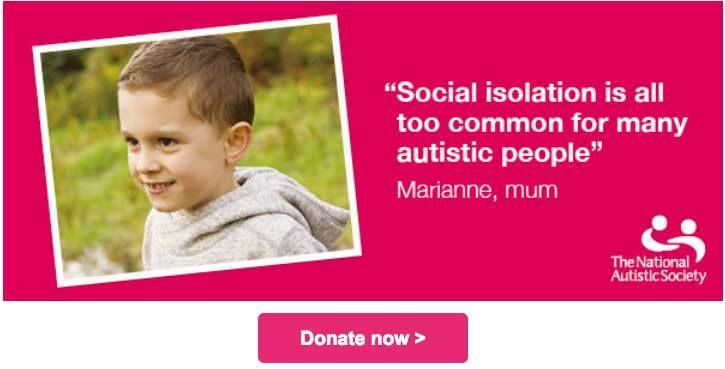 You may remember the email I sent you recently − my name’s Marianne, and my ten-year-old boy, Alexander, is autistic. Alexander can make sounds but can’t speak, making it difficult for him to communicate with anyone, let alone make friends. It’s hard to know how this makes him feel, as he can’t tell me But I can only imagine he feels isolated. Alexander really struggles going to places full of people. It can be too overwhelming and cause him to have a meltdown. It then feels like everyone around us just stares and makes comments. They assume he’s just a naughty child, rather than a little boy who’s struggling to cope. But with the support of people like you, The National Autistic Society is working to make the world a friendlier place for people like Alexander. Your gift will make a real difference. Donations from people like you go towards vital services such as the Helpline, which is a lifeline for many autistic adults and parents like me. Please donate today to help a family like mine find the support they need. Thank you. Ps If our messages have crossed and you have recently made a donation, thank you so much! We’re so grateful for your support. ‹ I’ve always felt like an alien. Now I know why. So true Social Isolation is all too Common for Autism People. With the loss of Autism Inclusive I include myself. Yep.. it’s not just the kids either far from it..